A controversial arms sale to Bahrain by the United States is set to go ahead despite heavy criticism from international observers that the arms will be used to quell future anti-government protests in the country. If the deal is allowed to go ahead it will highlight an already hypocritical US stance toward the Arab Spring. 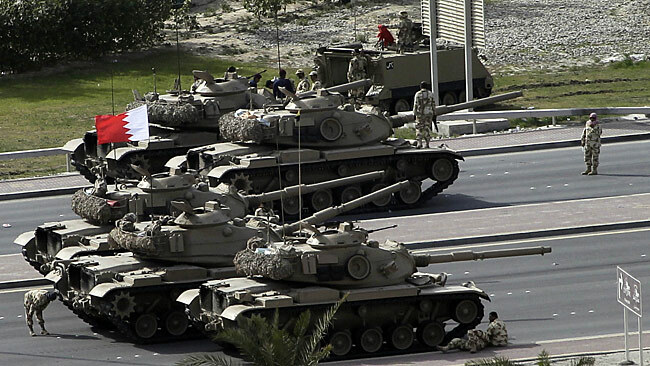 Bahrain’s military assembles outside Pearl Square, Manama. a focus of attention for most governments around the world. The varying stances taken by Western governments has been a hot topic, and with a US arms deal to Bahrain ready to proceed there seems to be a dubious standard separating the democratic aspirations from country to country. From timid backing of the Tunisian and Egyptian uprisings to military intervention in Libya to daily condemnations and sanctions against Syria, there seems to be little rationale dictating the positions taken by Western governments. Well, that’s not completely true. In dictatorial terms, were you a friend or a foe of the West while you oppressed your population? Foe – Ok, Mr. Assad and Mr. Gaddafi, your services are no longer required. Friend – Well then, King Al Khalifa, take some more weapons. No, no, don’t thank us, enjoy! We will consider all elements and circumstances on the ground – including human rights concerns, NGO (non-governmental organisations) monitoring and all issues that are part and parcel of the weapons sale process. Pearl Square, the centre of Bahrain’s uprising, under military attack. That seems unlikely. Heavy criticism is coming from a number of sources regarding this deal, and for good reason. The government of Bahrain, albeit with minimal pressure from the international community, heartily put down anti-government protests in a manner that did little to separate itself from other despotic regimes that were receiving much greater attention. Bahrain’s security personal were reportedly targeting medical personnelthroughout the crackdown who were trying to assist those injured in the violence. Since the end of the successful crackdown, Bahrain has tried numerous doctors, medics, nurses and paramedics who, authorities claim, were involved in the anti-government protests due to their performing their jobs as medical personnel. Some have received life sentences, others have been sentenced to death. 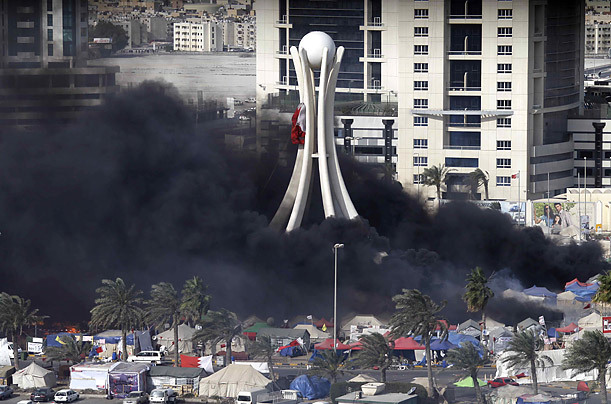 Bahrain’s government demolished Pearl Square, a national monument, after the uprising. Now, I realize Iran is the big bully in the Middle East these days, but it hardly seems realistic to suppose that the tiny nation of Bahrain is going to come under Iranian attack, not with Iran’s regional enemy Saudi Arabia right next door. So that really only leaves the latter reason for the arms deal: “specifically in hardening the country against opposition groups” and “illegal” anti-government demonstrations. While I wholeheartedly support the US and its Western allies in trying to reign in the ongoing crackdown in Syria, their stance in terms of Bahrain is troubling to say the least. If the US is engaged in hardening one oppressive regime against anti-government demonstrations and trying to strengthen sanctions against another, its moral stance in the world becomes irrevocably damaged in the process. Next Keystone XL Pipeline: Is it Worth the Cost?